Over 50% of the energy generated to power a typical urban building is lost during transmission from the power plant. What if buildings generated their own power on-site, or better yet, more than they needed themselves and became auxiliary power plants for others? Is a self-powered skyscraper feasible? We are exploring this question. 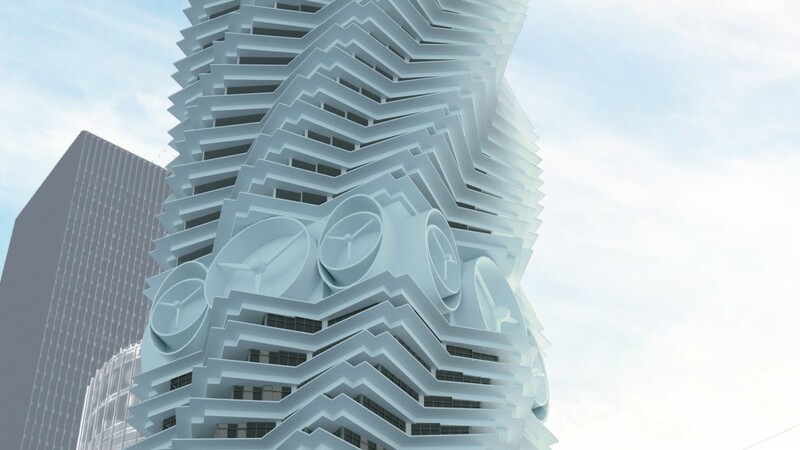 Integrating photovoltaics and wind turbines into the skyscraper design from the outset, we hope to achieve a sustainable aesthetic, one that is both productive and beautiful. This prototype could be located anywhere on the planet with enough indigenous fuel in the form of wind and sunshine to meet the energy demands of the building. The twisting form allows the floors containing the wind turbines to be oriented differently from its footprint so that the building can capture prevailing winds and yet fit into the street grid.